Have you ever visited the grocery store and stood in the spice aisle looking at what seems to be hundreds of herbs, spices, and blends? I was in my local grocery store, Country Mart, the other day and found myself staring at all those herbs and spices thinking "What is this spice? That looks interesting. I wonder what you put this in? I wonder where this herb comes from? How does this taste?" Pumpkin pie spice is a spice blend used often during the fall and winter holiday season. It is used in pumpkin pie of course, but it's also used in pumpkin spice cake, pumpkin bread, spiced nuts, pumpkin cookies, scones, pumpkin roll, pumpkin cheesecake, and many other goodies. It smells heavenly in the jar, just like the holidays! 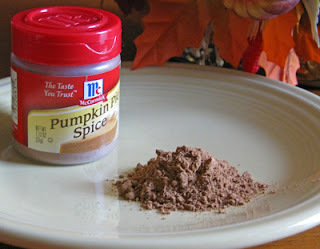 Pumpkin pie spice is a blend of ground cinnamon, ginger, nutmeg, and allspice. Sometimes ground cloves are added too. You can make your own blend if you have spices on-hand. The recipe below is from the 1995 Nov-Dec issue of Country Woman magazine. Mix all together. Store in an airtight container. Next time I will post a recipe for a quick-as-a-wink pumpkin pudding.